Strong ribs provided for optional dividers to increase storage options. Full length rear lip supports provided for hanging bins on louvre panels or rails.Reinforced ribs adds strength and avoids spreading. - Full length rear lip supports provided for hanging bins on louvre panels or rails. - Reinforced ribs adds strength & avoids spreading. - Reinforced ribs adds strength avoids spreading. - Provision for vertical dividers to increase storage options. - Full length rear lip supports provided for hanging bins on louvered panels or rails. - Anti skid strips provided at the base. - Extra wide stacking base for secure stacking. 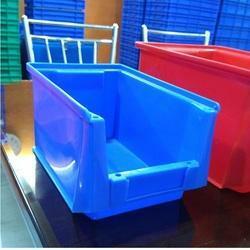 We are uniquely positioned amongst the respectable organizations of this domain by presenting an exclusive array of Rhino Tuff Bins.